Several readers have requested that I reorganize this blog so it’s easier to follow. Turns out the best way to read the entire thing is in forward chronological order — I had a book in mind the whole time I wrote it, and was careful to lay the groundwork for each concept before I presented it. Enjoy! I think you will find your journey a lot smoother. I am interested in discussion — you may comment, or write me at the Contact page. The Harmonic Lattice can be viewed as a map of harmonic space. Music moves in harmonic space, just as it moves in melodic space (the world of scales and keyboards). The two spaces are very different from each other. In melodic space, such as a piano keyboard, when two notes are close together, it means they are close in pitch. In a harmonic space, such as the lattice, when two notes are close together, it means they are harmonically related. “Harmonically related” means that one note can be converted into the other note by multiplying and dividing by small whole numbers. A note vibrating at 100 cycles per second is closely related to a note at 300 cycles per second. In melodic space, these two notes are far apart, but in harmonic terms they are right next door to each other — they harmonize. In my video, Flying Dream, I animated the movement of one of my songs on the lattice. Now I’ve animated a composition of W. A. Mathieu’s. Mathieu is the author of Harmonic Experience, an astonishing book that takes music back to its origins in resonance and pure harmony, and then uses the lattice concept to bring that harmonic understanding forward into the world of equal temperament. For me, the book opened the study of music like a flower. The lattice, and my stop-motion animations, have given me a sort of musical oscilloscope. Instead of the music being some sort of black box, I can see inside it, get a visual image of what is going on harmonically. The new tool has made songwriting, improvising and arranging much easier. I’ve animated Example 22.10 from the book. It’s intended to be an illustration of unambiguous harmony — the chord progression moves by short distances on the lattice, so it is clear to the eye and ear where you are. I think it’s a beautiful piece of music in its own right, a one-minute tour of a huge area of the lattice. It uses 28 different notes! There are two versions of the video. The first one, in ET, has a soundtrack of Allaudin Mathieu playing the piece on his beautifully tuned piano. This is perfect equal temperament. It uses twelve notes to approximate the twenty-eight notes that the piece visits. Stronger consonance and dissonance than in the ET version. The four voices, from lowest to highest, are red, green, orange and yellow. It’s fun to follow one voice at a time. This lattice is notated differently. It’s my usual system, but with letters instead of numbers. C is the tonic. Here is the video that started this blog. It is a stop-motion animation of my song Flying Dream, as it moves in harmonic space. It’s a preview of what the blog is all about. Red = bass, yellow = melody, and orange = the harmonies. Be Love is the second full song video I did. While Flying Dream is all over the lattice, Be Love occupies a small space, moving left and right between Major and Mixolydian modes. Real Girl lives in the lower right quadrant, minor and dominant. I’m posting these again so they will be close to the top of the front page. Anjalisa Aitken and The Harmony People have come into my life, and I’m shifting my focus from study and writing to performing and creativity. I think I’ve pretty well said what I have to say about the lattice for now. The videos are explained, and I’ve brought you pretty much up to speed with my lattice explorations so far. I’ll still be learning, and I’ll keep you posted, but I’m content with this particular yearlong blurt. Time to get out there and put all this cool stuff to use! There is plenty to find here. A random approach might work best — find a recent article that catches your eye, click links to go deeper, and use the back button to get back up the chain. I’m especially fond of the posts in the Septimal Harmony category. Enjoy, I’ll be back. Contact with fellow lattice-heads is welcome. The Harmony People (duo with Anjalisa) Beautiful, uplifting, interesting original music. Hotel Utah Artist Page — lots of live recordings. Hey, shouldn’t everyone have one? I’ve suggested many times on this blog that number is at the heart of all things. Here’s one article: Pythagoras’ Epiphany. I think the beauty of music, especially harmony, is similar to the beauty of math, but happening in real time. It slightly parts the veil, deepening the view of what is most basic and true about our universe. I believe that this connection with the deeper reality gives us a sensation of beauty. Here are a few more articles that go into detail, with examples and illustrations. If the Big Bang actually happened, then our universe blossomed outward from a point of infinite density, a singularity. What existed before that? I assert that it was number. The Big Bang was a mathematical event. What space did it occur in? One of the gnarliest problems in physics is the issue of reconciling gravity with the rest of the basic forces. There are four: gravity, electromagnetism, and the strong and weak nuclear forces. Gravity is the odd one. It is far weaker than the others. It appears to operate in a continuum, a smooth field, while the others seem to be quantized — that is, they come in little discrete packets. Even space and time themselves may be quantized. Math is like gravity, in that it works in a continuum. In the world of mathematics, there is no smallest anything. You can zoom in forever. Here’s an example. If I measure the circumference and diameter of a circle very accurately, and divide one by the other, I always get the same number, pi, about 3.14. If I measure more and more accurately, I can get the value of pi to quite a few decimal places, but even with the best equipment imaginable, I will eventually run into the sizes of atoms themselves, and the calculation can’t get any finer. But in the ideal world of math itself, pi goes out to as many digits as you please. There is no point where it runs into the grainy nature of reality. It’s as though in the real world, there are pixels, and when you blow things up enough they start to show, but math itself has no such trouble. Things are infinitely divisible. Einstein’s relativity and quantum mechanics are famously incompatible. Each describes the universe beautifully within our ability to measure so far. But it’s really hard to come up with a theory of reality that allows both to be true. Part of the problem is that relativity assumes a smooth continuum, and quantum mechanics assumes that on a tiny, tiny scale, everything happens in jumps, rather than smoothly. A theory of everything would have to explain how both relativity and quantum mechanics can be so true. The deepest reality, the substrate, upon which our universe is based, is simply the world of number. The universe we live in, with its stars and planets and galaxies and people, is a mathematical object, like the Mandelbrot Set or a cellular automaton, that grew from this substrate. 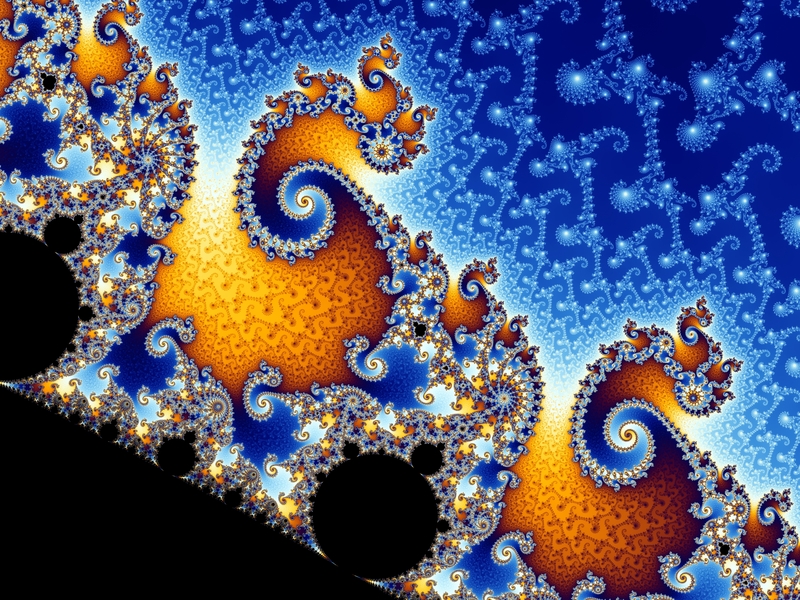 Here’s a tiny, tiny piece of the Mandelbrot Set. Click to enlarge for full glory! This is a mathematical object, at least as big as our universe, and if our universe is one too, then maybe the beauty of this object is related once again to the beauty of music, or of Keats’ Grecian Urn — it shows us, a little bit, the nature of Creation. If the deep reality is a continuum, and the immediate reality of stars and planets sprang from this continuum, then maybe gravity is different from the other three forces because it is a feature of the deep reality. It is a manifestation of the shape of space-time. It is working in the substrate. Relativity and gravity are happening in the basic reality, the continuum, the world of number. Quantum mechanics, electromagnetism, light, nuclear forces, matter and energy are all happening in the particular reality that came about when the singularity happened. Relativity and quantum mechanics can’t be reconciled because they actually operate in different realities — gravity in the basic reality, and the other forces in the immediate universe. If this is true, it may offer insight into the nature of dark matter. Dark matter has not been observed directly within our quantized universe. Its existence has been deduced, or conjectured, because galaxies move and rotate as though there is a lot of mass there that we cannot see. The idea is that dark matter interacts with “our” universe only through gravity, and not through the other forces. That is why we can’t see it, because seeing requires light. What if dark matter is something that exists in the basic reality, rather than in our particular Big-Bang-generated one? The only link between the realities would be gravity. There is no reason why our particular singularity should be the only one. Perhaps what we call dark matter is just the gravitational shadow of other universes. Ours is one of many universes, each one starting with a different set of “seed” values. Ours is of course perfectly designed for us to exist, and the other universes are also “coincidentally” perfect for whatever exists in them. The universes all exist in a space-time continuum, in which gravity is the only “force,” being actually a distortion of space-time as Einstein described. The universes can attract each other through gravity, and so they tend to clump in the same places. Here’s a terrific article on dark matter from April 2013 if you’d like to explore further.